Every April, elementary school teachers and librarians scramble for books to celebrate National Poetry Month and booksellers are hard-pressed to produce anything new and worthy. The standard favorites and repetitive collections are highlighted and praised for 30 days then poetry gets shoved back in the closet for eleven months. But poetry—often glossed over, taken for granted or dismissed as frivolous—is an essential medium. It often seems to get the same treatment as jazz: it is deemed important but does anyone really understand it, or care? Yet poetry enables teachers to teach their students how to write, read, and understand any text. Poetry can give students a healthy outlet for surging emotions. Reading original poetry aloud in class can foster trust and empathy in the classroom community, while also emphasizing speaking and listening skills that are often neglected in high school literature classes. Students who don’t like writing essays may like poetry, with its dearth of fixed rules and its kinship with rap. For these students, poetry can become a gateway to other forms of writing. It can help teach skills that come in handy with other kinds of writing—like precise, economical diction, for example. When Carl Sandburg writes, “The fog comes/on little cat feet,” in just six words, he endows a natural phenomenon with character, a pace, and a spirit. All forms of writing benefits from the powerful and concise phrases found in poems. However, despite being such a necessary form for understanding both language and the human spirit, well-crafted poetry collections are few and far between. When Green Becomes Tomatoes, a truly exceptional poetry book, is a rare gift and will no doubt be a timeless classic for generations to come. Poetry is characterized by an economy of words and Fogliano is adept at economical writing. Poetic in their simplicity her picture books, And Then it’s Spring and If You Want to See a Whale, demonstrate this austerity as well. Her refined prose is imbued with a childlike perspective that speaks to its readers on an elemental level. Reading her carefully chosen words, it’s clear that none are wasted. Fogliano writes with a beautiful simplicity that can make people believe writing for children is easy, but I assure you it is not; achieving this kind of elegant perfection requires an immense amount of skill. Beginning and ending with a poem for the first day of spring (March 20th), the 47 poems in When Green Becomes Tomatoes are named for the dates they honor. Fogliano’s masterful compositions encapsulate the very essence of each season and every one of these captivating, playful poems immerses its reader in a moment. Her style, distinctly her own and one I expect many will try (and fail) to replicate, can rightly be compared to such icons as Ruth Krauss and e e cummings. Some of these poems could easily stand alone as their own books. Morstad’s art is perfection: never excessive, always inviting. Her illustrations, luxurious at times and modest at others, harmonize with the text. Adjusting her palette to the season, choosing warm or cool colors as needed, she captures the spirit of the ever-changing flora and fauna. With a style that is reminiscent of Alain Grée and Ezra Jack Keats, she depicts a diverse group of children to accompany readers on their journey through the seasons. At a time when the lack diversity in children’s books is being spotlighted, her multi-cultural cast is an oasis in a desert. I’m an avid lover of the changing of the seasons; it’s such an invigorating time. I love seeing the first heralds of spring, feeling the first hint of summer heat, smelling the first breeze of autumn and experiencing the unadulterated joy of the first snow. Superbly capturing all the inherent delight that these harbingers induce, Fogliano and Morstad have created the perfect companion to all the glorious wonders of the seasons. A marvel as welcome as spring’s first blush of color after a long, drab winter: When Green Becomes Tomatoes: Poems for All Seasons is a thing you knew you needed but didn’t fully comprehend how much until you finally had it. 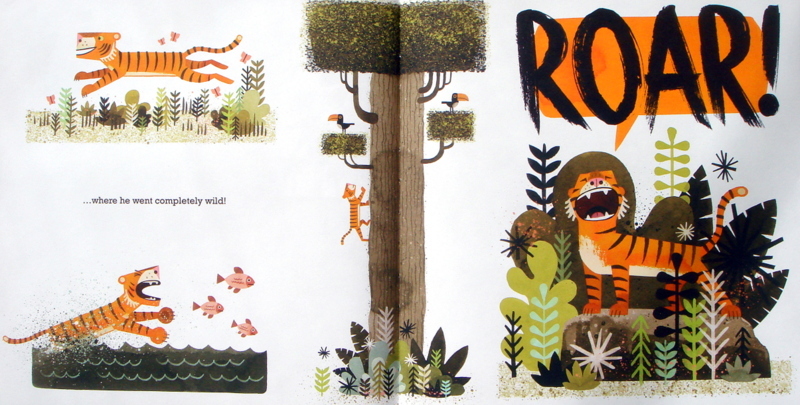 Mr. Tiger Goes Wild by Peter Brown: An instant classic. 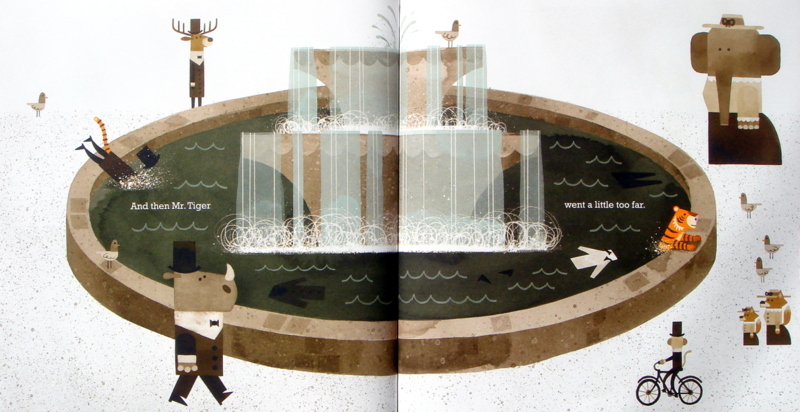 This is Peter Brown’s ninth picture book and I’ve grown to love him more and more with each one. With scenes that unfold in playfully designed locations, and supremely likeable, quirky characters, readers can’t help but be lured into the world of Mr. Tiger. Brown was awarded a 2013 Caldecott Honor for Creepy Carrots and, truth be told, I was a little disappointed that Mr. Tiger Goes Wild was not among this year’s Caldecott recipients. Brown’s art is evocative of Ezra Jack Keats, Margaret Bloy Graham and Miroslav Sasek, yet despite displaying shades of all these masters, Brown’s pleasing and idiosyncratic artistic style stands out as uniquely his own. 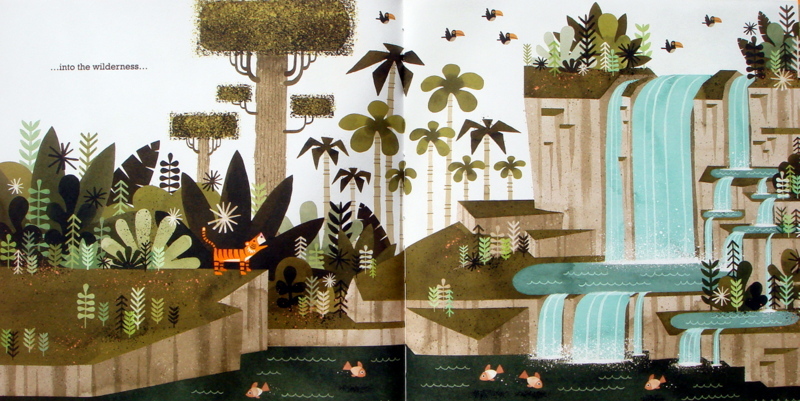 Certain spreads reminded me of the animated Disney film, The Jungle Book and I later read in an interview that Brown watched a lot of old animated Disney films, including The Jungle Book, while working on Mr. Tiger. 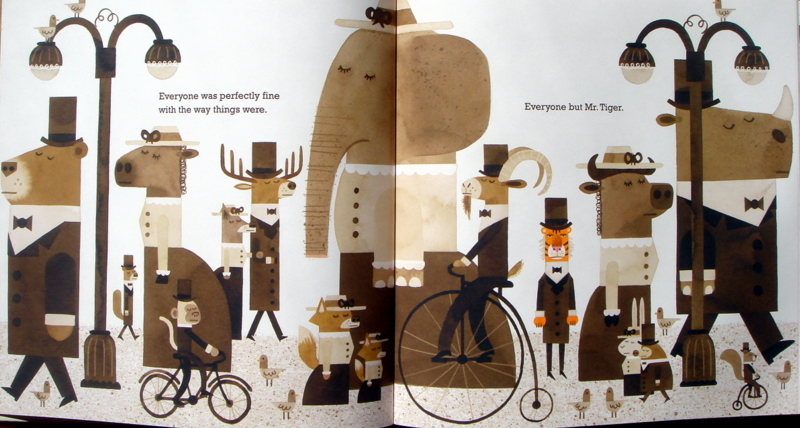 The opening spreads of Mr. Tiger Goes Wild introduce Mr. Tiger’s world, replete with upright quadrupeds adorned in stiff Victorian attire. The perfectly ordered art is created with a muted palette of grays and browns. As the story progresses, the art grows more feral and verdant; the final spreads strike a satisfying balance between conformity and frenzy. 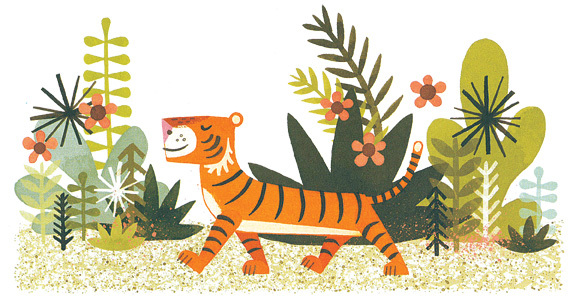 The consistent palette of greens, grays and browns is broken only by Mr. Tiger’s delightful flare of orange. 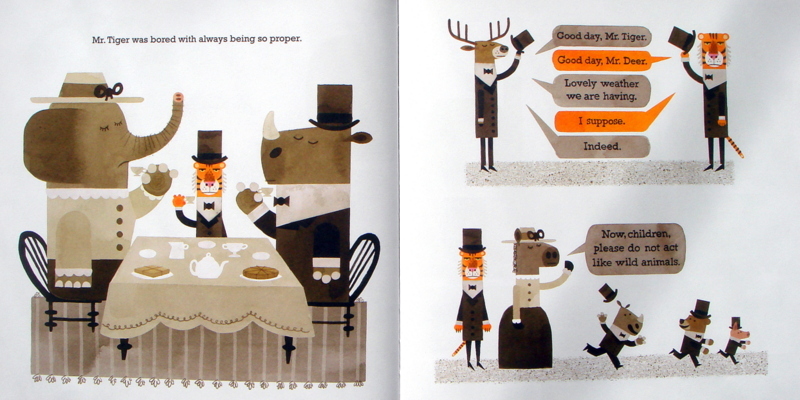 Brown’s skillfully efficient story telling allows for sparse text; there are several spreads with no words at all. His cheeky narrative breathes humor and energy into the already astounding artwork. 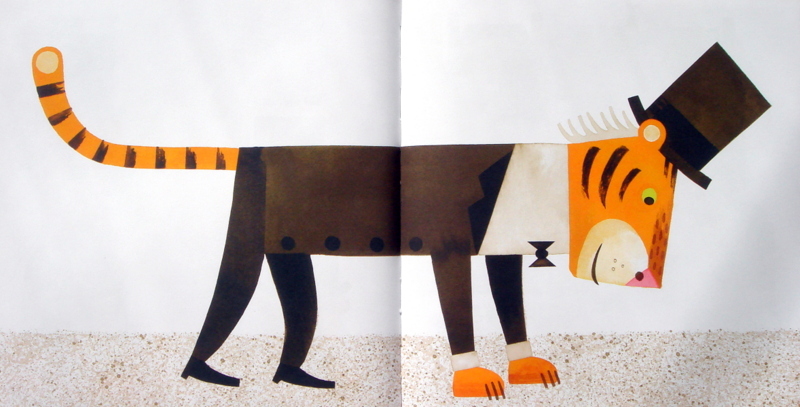 As the story opens, Mr. Tiger is a dapper, city-dwelling cat with an undeviating expression of displeasure. He lives among respectable animals in a proper society. Everyone around him seems perfectly content but Mr. Tiger is bored. At this early stage of the story almost all of the characters are going about their lives with closed eyes. Mr. Tiger (who is on the verge of acting wild) and the children (who are being scolded for acting wild) are the only ones with open eyes. As soon as Mr. Tiger carries out his first wild idea, everyone’s eyes are open. Mr. Tiger immediately felt better and grew a little bit wilder each day; before long, he’d pushed it too far. His friends, outraged, suggested that Mr. Tiger take his behaviors elsewhere, and into the wilderness he ran. As time passed, Mr. Tiger grew lonely; he missed his home and his friends. He decided to return to the city. Upon returning, Mr. Tiger found that a wonderful thing had happened. His friends and neighbors were no longer perfectly genteel—though still sporting Victorian attire, some had taken to all fours. Mr. Tiger Goes Wild is all about balance—wild behavior can be beneficial, in appropriate contexts, civilized behavior is necessary if you want to exist in a society—and this book strikes a perfect balance on every level. Certainly there are plenty of books that enjoy long lives as classics without any medals adorning their covers. Conversely, some medal-winning books fade into oblivion not long after their initial time in the spotlight. Though I believe this book deserved the recognition of the Caldecott committee, I also believe it will live a long life in print just like some other non-medal winning, perennially adored classics. Mr. Tiger Goes Wild will be in good company with Corduroy, Harry the Dirty Dog and Mike Mulligan and his Steam Shovel. Ezra Jack Keats New Writer Award goes to Julie Fogliano! Congratulations to Julie Fogliano, friend of TurtleAndRobot and author of And Then It’s Spring (illustrated by Erin E. Stead) for winning the Ezra Jack Keats New Writer Award for Children’s Books! A well deserved award for a stunningly talented writer. I have personally selected all of the titles so even if I have not yet reviewed it you'll know it's a book I love. Shop from my selection, or anything else on Amazon. I appreciate your support!